My Nissan Skyline GT-R is currently parked on display in a museum next to an original 1962 Ferrari 250 GTO. This is an incredibly special moment, and it’s a tremendous honor, and I’m very proud of it, even though it’s also parked next to a 1988 Honda CRX. You’d know all about my Skyline’s museum display status if you followed me on Twitter, because I recently tweeted a photo of my Skyline and a Ferrari 250 Testa Rossa in the same image. This is the first time these two cars have ever been together in one place, unless you’re playing Forza with your mom, and you’ve chosen the old Ferrari to give her an advantage because she’ll probably hit the wall more often than the puck in an ice hockey game. 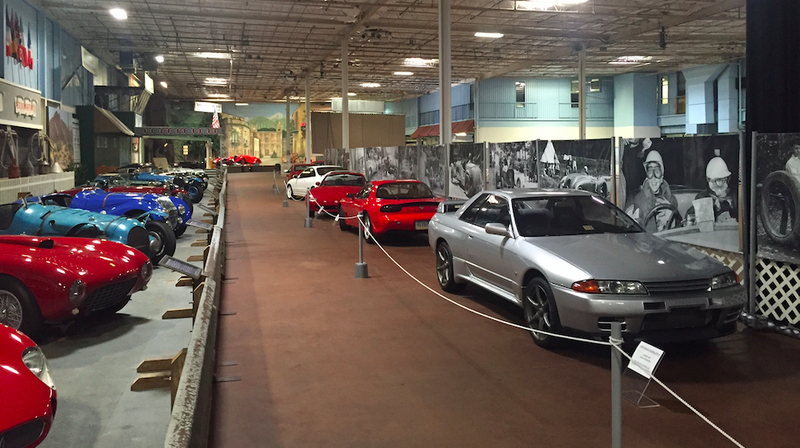 But you probably have a few questions about my Skyline’s museum appearance. For example: what kind of museum displays a middle-aged Japanese car? Why is my Skyline in a museum? How exactly do you get your car displayed in a museum? And most importantly: who plays Forza with their mom? I’ll be tackling all these challenging queries and more in today’s column. Let’s start with: What kind of museum displays a middle-aged Japanese car? The answer is: an awesome one. My Skyline is currently on display at the Simeone Foundation Automotive Museum, which is home to a litany of amazing cars, including a Nurburgring-winning 1958 Aston Martin DBR1, an amazing 1964 Shelby Daytona, two 1930s Alfa Romeo 8Cs, two Ford GT40s, a 1956 Jaguar D-Type, a Porsche 917, and several classic Ferraris and Maseratis. If there’s a fire, they will not be saving my Skyline first. So why the hell would a museum with a legitimate, impressive collection of multi-million dollar cars want my 1990 Nissan, which includes a) a mini-disc player, and b) roughly the same amount of alloy wheel curb rash as a sorority girl’s 328i? Well, you see, my Skyline is playing an integral part in the museum’s Legends of Japan display, which includes a wide range of the most exciting, enjoyable, seminal Japanese cars ever made, and also that CRX. There’s a Subaru Impreza 22B, a Lexus LFA, a Toyota 2000GT, a perfect Mark IV Toyota Supra, a gorgeous 1993 Mazda RX-7, and several other highly unique vehicles, including my Skyline. This is an excellent display, and if you’re in the Philadelphia area, you should certainly check it out, and then send me a picture of my car so I can be certain that it’s still silver. Now on to the more pressing question of how the hell your do you get your car in a museum? Here’s the general overview: as some of you know, I occasionally write for a website called Jalopnik, which is an online community for people who turn their heads when a Saab 9-4X passes by. Anyway: one of those interesting characters is my friend Joe, who works for the Simeone Museum. Joe contacted me about a month ago and told me the museum was planning to put together this display. An then he asked if I would be interested in having my car in it. Now, ladies and gentlemen, when the Simeone Museum contacts you to ask if you’d like them to display your car, you don’t think about it. You don’t mull it over. You don’t consider your options. This place has a car collection that’s worth more than Swaziland. When the Simeone Museum asks to display your car, you say yes, and you ask them how long they’ll need it, and you ask them if they’ll need you to wash the floors underneath the spot where your car is displayed. So that’s how they found me, and now my car is sitting there, in the museum, next to the 250 GTO. How they found the other guys, I have no idea, though I suspect it may have involved an Instagram search for the hashtag #JDMTyteYo. So my Skyline will be in the museum through Sunday, July 19, at which point I will pick it up and go back to making mediocre YouTube videos for everyone to enjoy. As for playing Forza with my mother, I have never personally experienced this, though I will say my mom has recently mastered text message emojis. This is a gateway drug, and I have no doubt that by Christmas, she will be careening around the Nurburgring, insistent on more power. Perhaps she should buy that guy’s manual Acura TL.